Orcs in the Webbe is continuing their Advent scenario releases with Disposable Heroes. 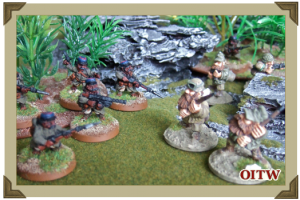 Orcs in the Webbe brings you another all original exclusive in the form of full rules and a scenario for using Black Hat miniatures Halflings in Wessex Games' alternate World War I/II wargame, Panzerfäuste. Steiner and the rest of StrafGruppe Loki, on a vital mission to destroy a shipment the Orcs fortifying cha leaves, come up against the native askari troops... The Halfelins.